With their unique markings and funny way of waddling, skunks can be an interesting sight for humans and pets alike. But there’s no rose without a thorn, and anyone who bothers a skunk may learn first-hand why even bears tend to leave these critters alone! In a perfect world, only other wild animals would ever get sprayed by skunks. But since we don’t live in a perfect world, let’s take a moment to talk about responding to skunk stink bombs. ■Render first aid if necessary. As with any wild animal encounter, this should always be your immediate reaction. If the victim was hit in the face with musk, their eyes should be flushed with cool water for several minutes. Any scratches should be treated with antibacterial cream or spray to reduce the risk of infection. And if the pet or human in question was actually bitten by the skunk, then they’ll need to see a veterinarian or doctor so that anti-rabies measures can be taken. Don’t skip that last one just because the skunk didn’t appear to be rabid; this is definitely one of those “better safe than sorry” scenerios! ■Stay outside (or be careful indoors). If at all possible, the victim should stay outside until the skunk odor has been addressed. Obviously, this is easier to do if it was a cat or dog who got sprayed; humans may need to come inside in order to wash up (or remove their clothes without offending the neighbors). The idea, though, is to keep the smell from permeating your house; it’s better to keep it “contained” to your yard or patio. If the victim needs to come inside, they should walk straight to a bathroom and try not to touch anything on their way in. Keep them off the furniture! It’s usually harder to shampoo a couch than it is to shampoo a child. A commercial skunk-odor remover. These can be found at most pet stores and some hardware establishments. Verify before you purchase a certain solution that it’s safe to use on pets and humans (some are only intended for use on furniture or patio decks), and be sure to follow the directions on the bottle carefully. A peroxide and baking soda solution. This is a popular home remedy that many folks swear by. Mix together one quart of 3% hydrogen peroxide, ½ cup of baking soda, and one teaspoon of dish soap or laundry detergent. With gloved hands (and a sponge or washcloth, if you can spare one), scrub the victim’s fur and/or skin thoroughly with the mixture. Let it sit for five minutes, and then rinse it off with cool water. Repeat if necessary. The peroxide and baking soda will help neutralize the odor, and the dish soap will help remove oily residue. The peroxide may have a bleaching effect on hair and fur, and it might also be pretty harsh on folks with sensitive skin. Only leave this stuff on for five minutes at a time, and discontinue its use immediately if the victim has a bad reaction to it. Any leftovers of your anti-skunk brew should be diluted and then flushed down the drain. Do not attempt to store it; the mixture will expand over time, which means that it can cause a sealed container to explode. After rinsing away the chosen cleaning solution, the victim should take another bath with regular soap and/or shampoo. For pets, this means washing them with their usual coat cleanser. For humans, this means scrubbing down with moisturizing body wash, shampoo, and conditioner. 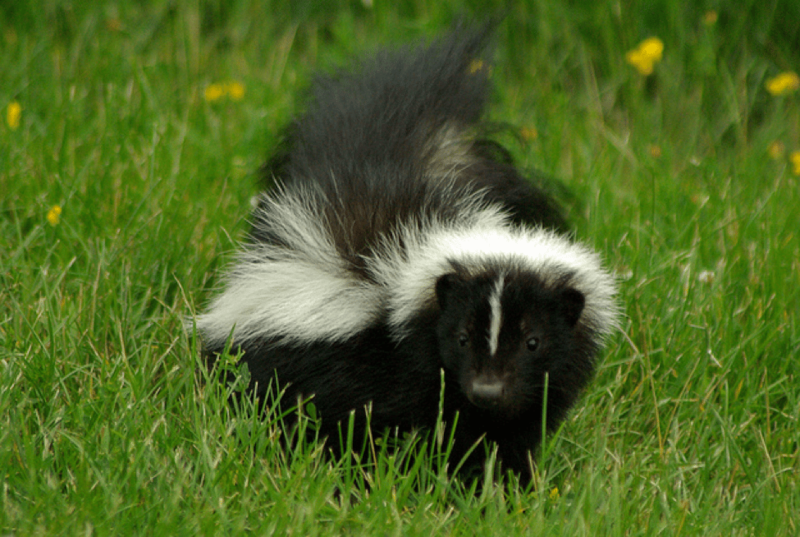 Skunk musk is notorious for its lasting odor, so it’s possible that you’ll still smell some traces of the stuff despite all of your efforts. You can continue using the aforementioned products and techniques, but it may get to the point where you just have to be patient and allow the smell to dissipate naturally. When it comes to “Wildlife Encounters That Most People Would Like to Avoid,” getting sprayed by a skunk is usually pretty high on the list. While it is possible to treat the odor, it’s better to avoid being “skunked” at all. So please, folks: stay away from skunks. And if you discover one living under your deck, in your shed, or even in your basement crawlspace, don’t try to evict it on your own. Call in an expert!